It’s that time of year, when we are all running around frantically to get things done. Food to buy, presents to get and friends to catch up with before the holidays start. For me I like to take a break from the shops, to avoid all the hustle and bustle. I try to do my shopping in chunks and plan ahead. When all else fails, I turn to food to include in my Christmas giving. Last year I made this recipe for my brother and sister. Normally we do not swap presents at Christmas with my siblings, but I know how much they like sweet things, especially my brother so it was a little surprise for them. 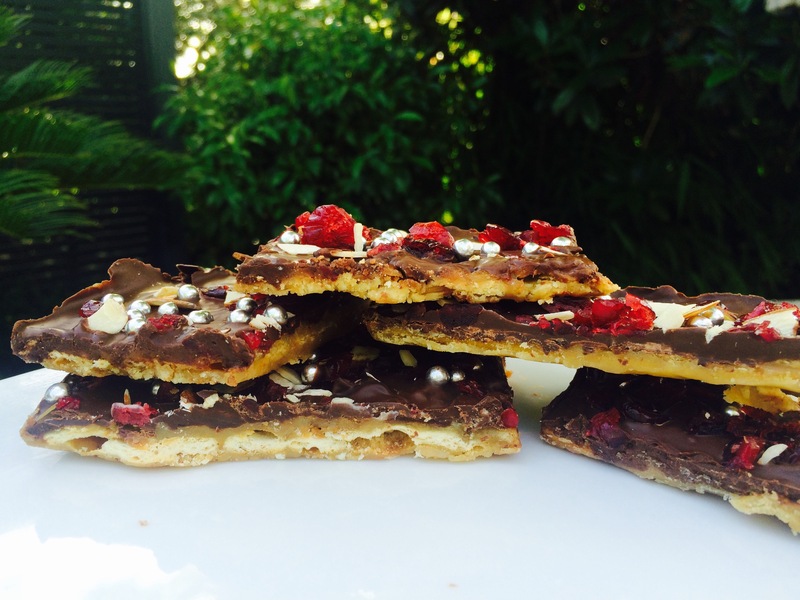 I bought some large jars and filled it with my fav choc brownie and this Salted caramel cracker slice. I am now going to make this every Christmas. This is the beginning of a new tradition for me. Hey, we all like a bit of tradition in our life. Traditions create memories. So get in the kitchen and start your own tradition. Be warned this slice is very moorish and addictive. Note : variation of toppings: you can change the tooping to suit. This year I replaced the pistachios with slivered almonds and silver cachous. The little silver pearls go very well with the decorations on my Xmas tree! Place the crackers in the shallow tin, without overlapping so that the base of the tin is covered. Break up the crackers to fit. Melt the butter and sugar in a saucepan over a medium heat, until the mixture starts to bubble and is combined. Remove from the heat and sprinkle chopped chocolate evenly over the caramel. Return to the oven for a further minute until the chocolate has just melted enough to be able to spread. Sprinkle over your desired toppings. Put in the fridge to set, and then cut into pieces. Looks and sounds fab. Very festive! Thanks! Will def give this a go.